Graham Dorrington is an Englishman who maintains a collec¬tion of antique farm tools, assembled by his late father. It contains some eight hundred pieces: sheep shears and dyke shovels, a horse-grooming scraper and a muck rake, a variety of manure knives, a bull nose ring, an assortment of turnip choppers, all manner of breastplows, and something called a wooden dibber. The tools are made of wood and iron; they are meant for working the ground; many of them depend, for their function, on com¬pliance with the downward drag of gravity; and their design has an earthbound, utilitarian simplicity. In all these ways, the tools reflect qualities that are exactly the opposite of Dorrington’s great passion and vocation, which is flying. 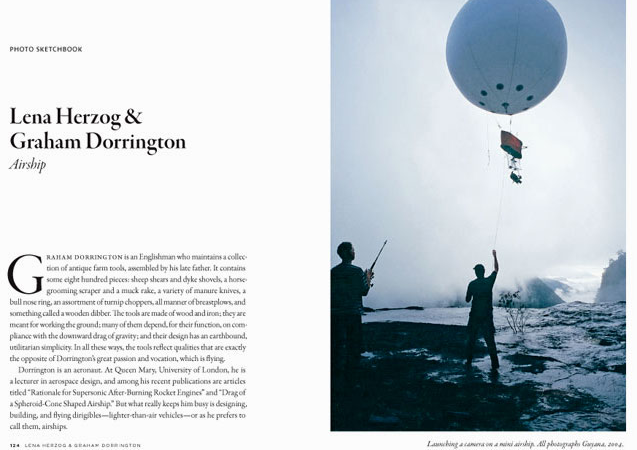 Dorrington is an aeronaut. At Queen Mary, University of London, he is a lecturer in aerospace design, and among his recent publications are articles titled “Rationale for Supersonic After-Burning Rocket Engines” and “Drag of a Spheroid-Cone Shaped Airship.” But what really keeps him busy is designing, building, and flying dirigibles—lighter-than-air vehicles—or as he prefers to call them, airships. Why does he fly such unlikely contraptions? He says he does it in order to study the extraordinary biodiversity of the rainforest canopy, the tree¬top world that is brimming with otherwise inaccessible flora and fauna. In fact, Dorrington has invented and devoted himself to an entirely new field: dendronautics, from the Greek dendron (tree) and nautica (navigation). In 1993, during an expedition to Sumatra, a gust of wind caused one of Dor¬rington’s airships to buck, throwing Dieter Plage, a celebrated German cin¬ematographer of nature documentaries, overboard to his death. Haunted by this tragedy and possessed as ever by the dream of pure, silent, slow flight over the jungle treetops, Dorrington mounted a new expedition in 2004, this time to Guyana, in the company of the filmmaker Werner Herzog, whose film of the journey is called The White Diamond.